BETA Test: EMV Chip Swap™ Procedure** (the EMV chip from the original plastic card is extracted and implanted to the new metal card; old plastic card is rendered obsolete). New metal card is **100% fully functional. This procedure is available to clients worldwide. All Semi-metallic cards are 80% successful with this procedure (small & large chip) i.e Sapphire CSP, Amazon metallic credit card, Semi-metallic Platinum or Gold Express cards; Wells Fargo Propel red metallic card, etc. If a semi-metallic card is sent in for production the laboratory will perform the Chip Swap, but the client is reminded of the risk of failure. 20 out every 100 semi-metallic cards fail the chip swap procedure. **Plastic cards with the RFID/Touch Pass/PayWave logo are 85% successful (see RFID Logo below). This means the chip will function on the new metal card, but the contactless feature is disabled. See FAQ #39 for more detailed information. All Semi-metallic cards with the RFID Contactless Touch Pass/ PayWave logo are 60% successful with this procedure. Meaning the chip will function on the new metal card, but the contactless feature is disabled. Magnetic stripe on original semi-metallic card will still be functional. New metal card magnetic stripe will be 100% fully functional. **RFID Contactless Touch Pass/ PayWave Logo. Warranty: Standard Warranty Applies (see Warranties). Extended Protection plan now available. Please Note: Do not add this process to the cart alone unless prompted by customer service. **due the sensitive nature of the chip construction. There is a low possibility of Chip Damage occurring during the EMV Chip Swap procedure. 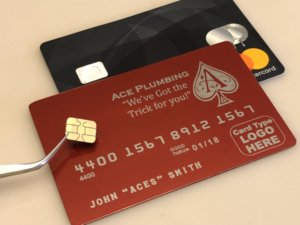 **In the off chance of a client’s original EMV chip is damaged during the swap procedure, the client will be notified and asked to request a replacement card from their financial institution/cc company. This will delay the production process. **Beta EMV Chip Swap™ procedure overall average is 96% Successful, but in the off chance that the chip does not function when a client attempts a transaction; the registers EMV Bypass protocol will take effect; forcing the client to SWIPE the card; thus allowing the client to complete a transaction. **RFID Contactless Touch Pass/ PayWave Cards are identified by the PayWave Logo seen in the example above. If your plastic card has this logo printed on it, be aware those types of cards have a 80% rate of success with the Beta EMV Chip Swap Procedure. Meaning the chip functions 100%, but the contactless feature is completely disabled. **The laboratory at MCC is perfecting the procedure daily. Rest assured our laboratory techs will apply great care to the construction of your New Metal Credit/Debit Card. 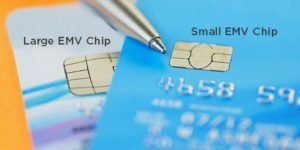 All Beta EMV Chip Swap™ Procedure sales are Final – once the procedure is performed; the original plastic card can not be salvaged.